By combining multiple nanomaterials into a single structure, scientists can create hybrid materials that incorporate the best properties of each component and outperform any single substance. A controlled method for making triple-layered hollow nanostructures has now been developed at KAUST. 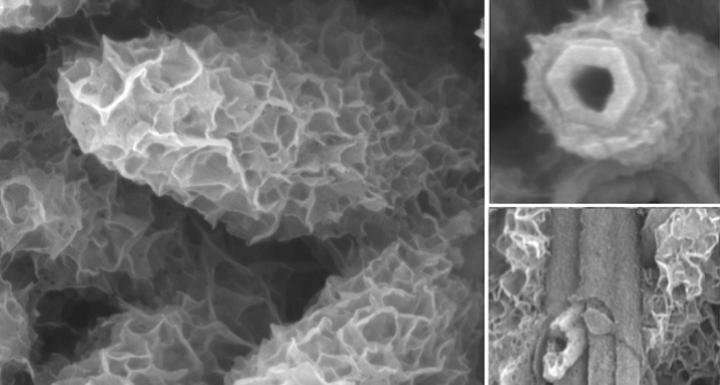 The hybrid structures consist of a conductive organic core sandwiched between layers of electrocatalytically active metals: their potential uses range from better battery electrodes to renewable fuel production. Although several methods exist to create two-layer materials, making three-layered structures has proven much more difficult, says Peng Wang from the Water Desalination and Reuse Center who co-led the current research with Professor Yu Han, member of the Advanced Membranes and Porous Materials Center at KAUST. The researchers developed a new, dual-template approach, explains Sifei Zhuo, a postdoctoral member of Wang's team. 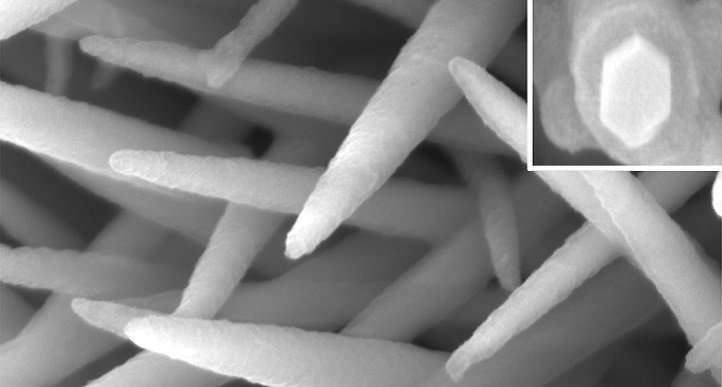 The researchers grew their hybrid nanomaterial directly on carbon paper—a mat of electrically conductive carbon fibers. They first produced a bristling forest of nickel cobalt hydroxyl carbonate (NiCoHC) nanowires onto the surface of each carbon fiber (image 1). 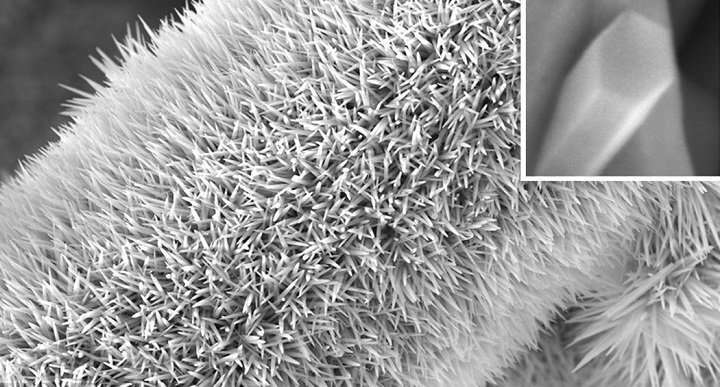 Each tiny inorganic bristle was coated with an organic layer called hydrogen substituted graphdiyne (HsGDY) (image 2). Next was the key dual-template step. When the team added a chemical mixture that reacts with the inner NiCoHC, the HsGDY acted as a partial barrier. 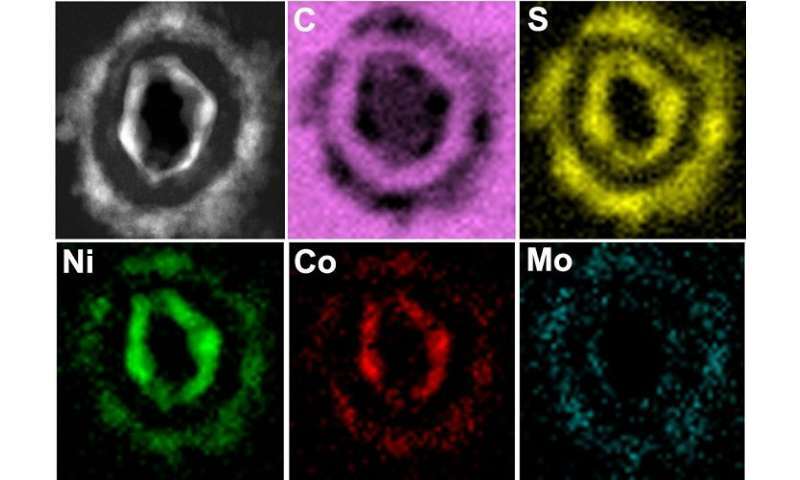 Some nickel and cobalt ions from the inner layer diffused outward, where they reacted with thiomolybdate from the surrounding solution to form the outer nickel-, cobalt-co-doped MoS2 (Ni,Co-MoS2) layer. Meanwhile, some sulfur ions from the added chemicals diffused inwards to react with the remaining nickel and cobalt. The resulting substance (image 3) had the structure Co9S8, Ni3S2@HsGDY@Ni,Co-MoS2, in which the conductive organic HsGDY layer is sandwiched between two inorganic layers (image 4). "These triple-layered nanostructures hold great potential in energy conversion and storage," says Zhuo. "We believe it could be extended to serve as a promising electrode in many electrochemical applications, such as in supercapacitors and sodium-/lithium-ion batteries, and for use in water desalination."